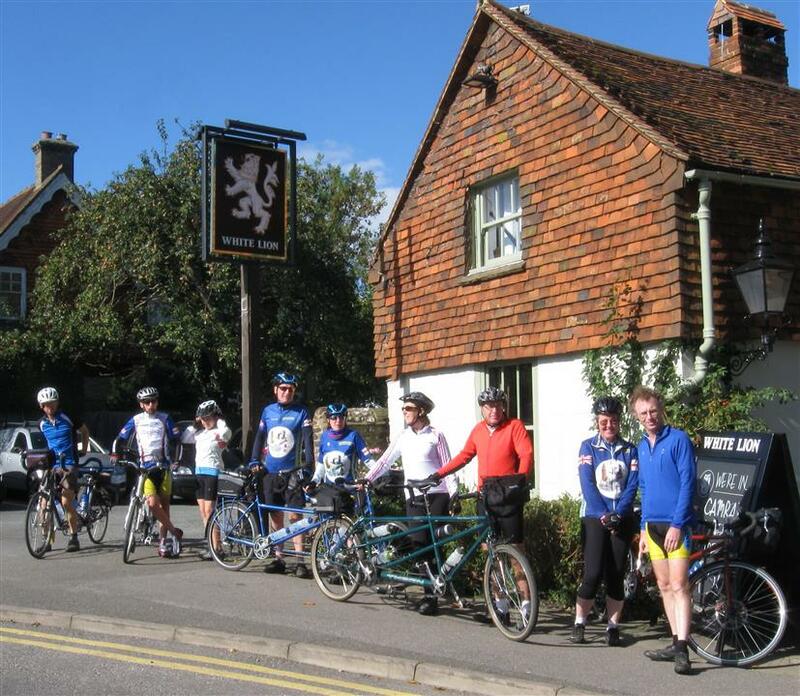 For a list of all tandem events in and around Kent, click on the Diary 2015 page where you will also see events and rides organized by the Tandem Club Surrey & Sussex. Leaving the pub, which way are we going? Do hope that a few of you will be able to come and join us, on this ride. Please let us know if you hope to attend so we can give the pub an idea of how many there will be." Come on! The others are ahead. Having met at the council offices car park, the start took us through a rather inauspicious housing estate before a sharp right between houses put us on the Stour valley cycleway to Fordwich. Unlike so many off-road Sustrans routes this was quite direct and without any difficult barriers. A short climb gave good views of the Stour valley lakes before a descent to Stodmarsh, Wickhambreaux, with its weather boarded watermill, Ickham with its Flemish style houses and with Jim and Kate sprinting ahead, so that they could get to the café before their tyre needed inflating again, we arrived at Dene farm coffee shop. Chillenden windmill looked splendid in the bright sunshine but Snowdon Colliery is still a depressing collection of derelict buildings, the working men’s club boarded up. The second puncture of the day at Woolage required a stop as we were to far from lunch, but we still made the Black Robin in Kingston in good time. 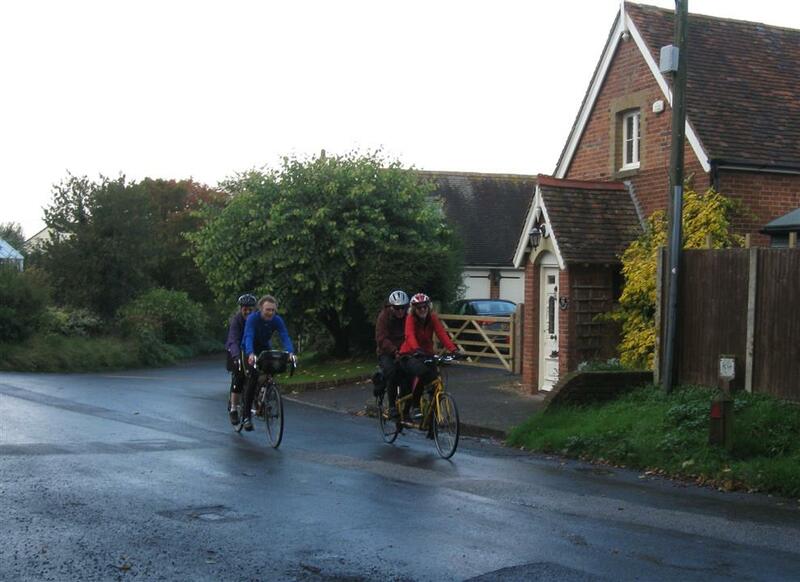 The climb out of the Elham valley helped to warm us up, although the weather was unseasonably mild. Through, Pett Bottom, where a plaque on the wall of the pub claimed that Ian Fleming had stayed there whilst writing a Bond novel. 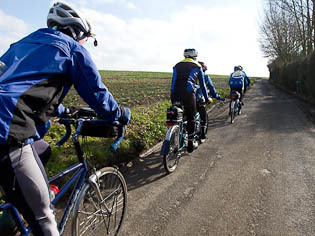 Over the undulating Chartham downs before decending to re-join the Stour valley cyclepath at Chartham. With such a sunny day, it appeared that all the residents of Canterbury had come to walk their dogs, push pushchairs or bring the young kids out on their wobbly bikes. Surprisingly, we managed to negotiate the path, without colliding with any of these moveable obstacles. This however became impossible on Canterbury’s packed high street, so we walked to the museum for afternoon tea. 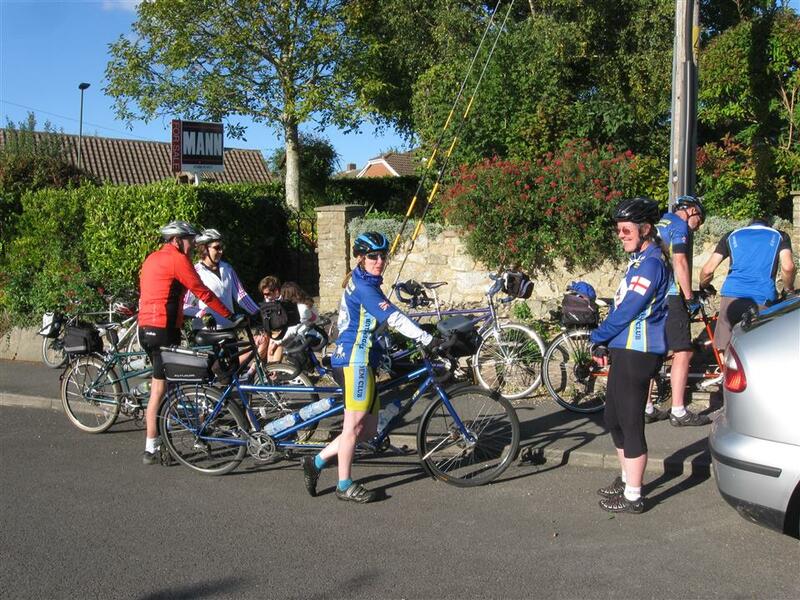 It was then a very short ride back to the cars, except for Jim and Kate who had heroically ridden to the start from home in Whitstable. We will be starting at Gravesend cyclopark TQ (5)640(1)714. 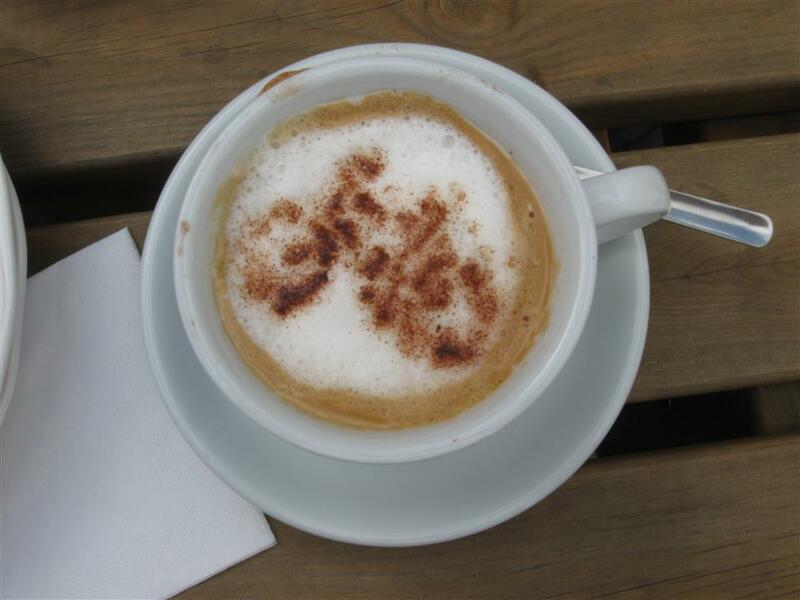 Meet at 9.45am - if you are early you may be able to get a coffee before we start. We will have a coffee break and lunch stop. Please let us know if you are interested so we can let the pub know numbers. 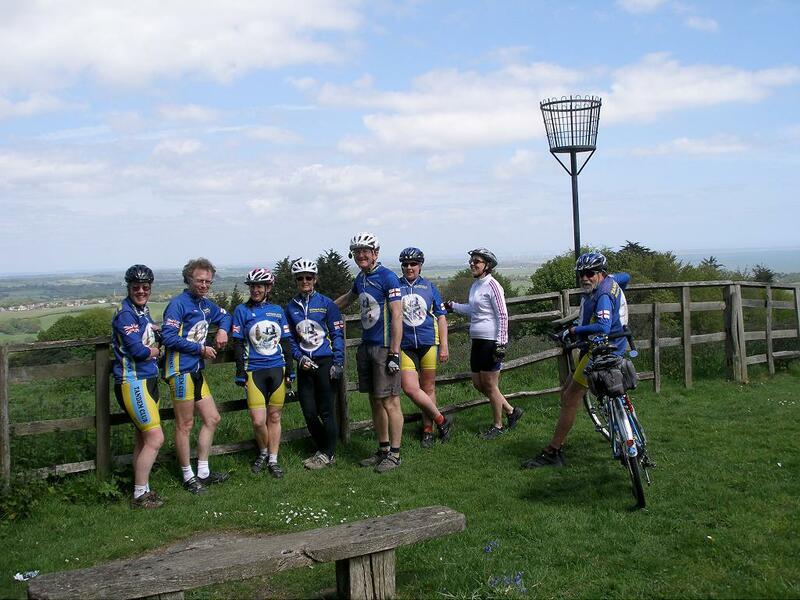 We will be starting Sunday's ride from the car park in Penshurst Grid Ref 525438. There are no toilets - but the Fir Tree Tea Rooms say we are welcome to use theirs. We will make our way to Capel for lunch and when we get back to Penshurst we will go to the tea rooms. The pub wants to know numbers and maybe menu choices as well so if you are interested please reply to us by Friday 17th. Thanks. 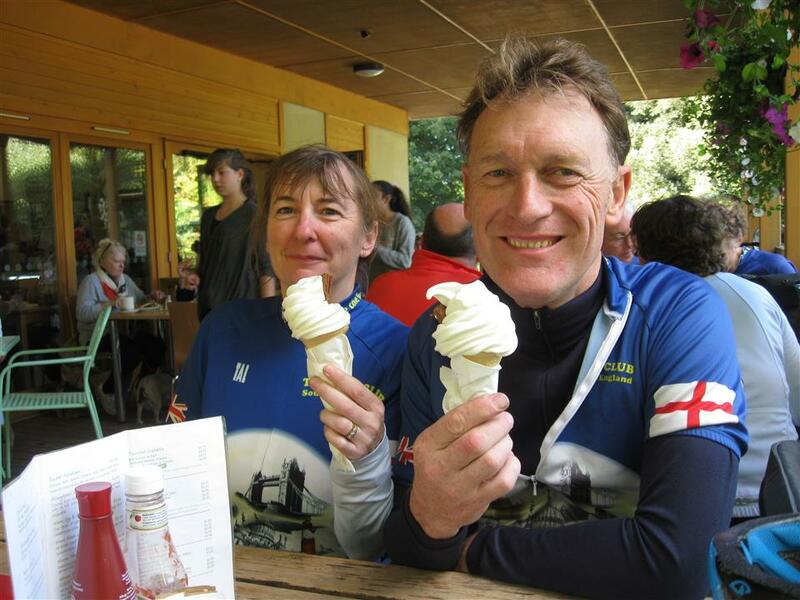 Dave was unable to make this ride due to work commitments, so Caroline - helped by Cliff and Pauline - lead this ride. We eventually got underway after Cliff had sorted out Mark and Liz's brakes. 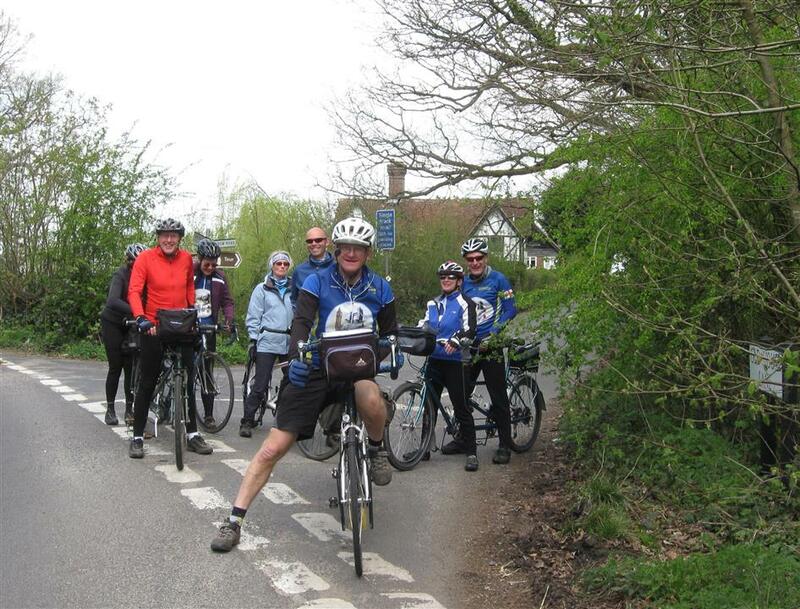 We headed south to Langton Green and across to Frant. 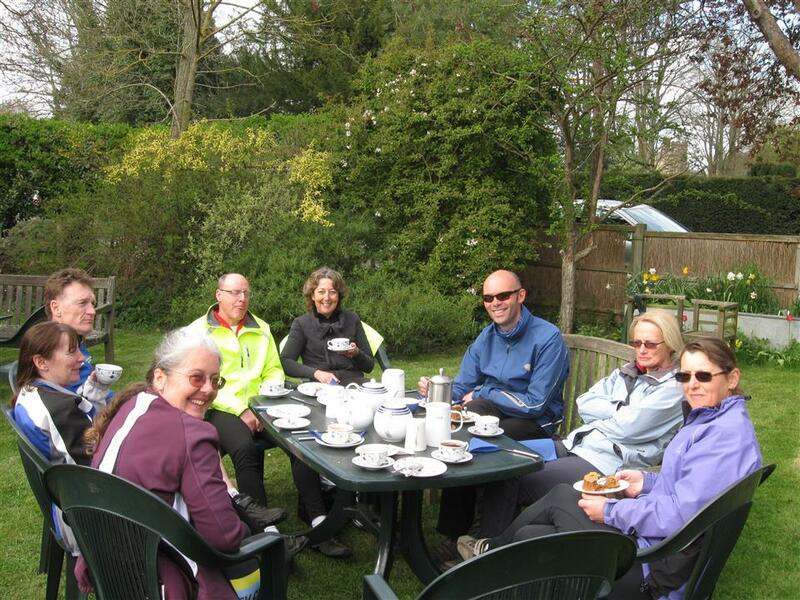 We made use of the benches on Bells Yew Green to take a break and enjoy some flapjack. 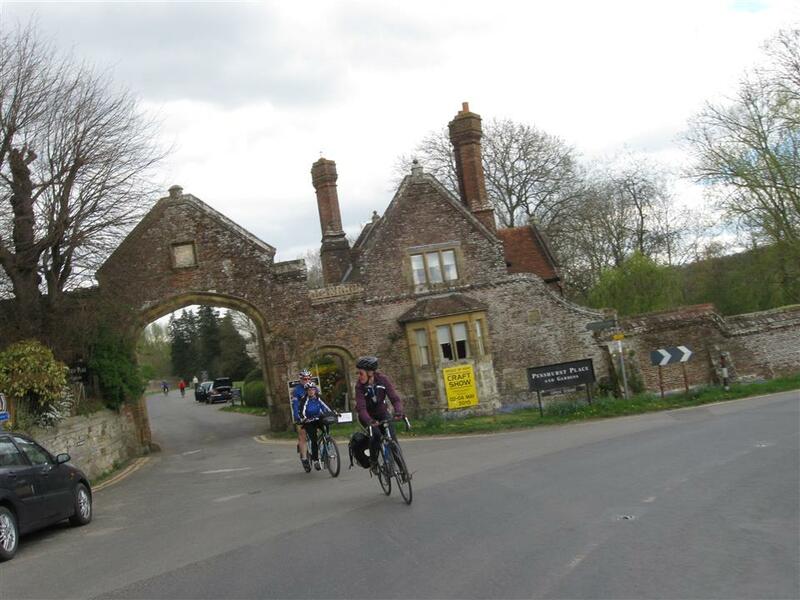 We sped along through Kipping's Cross and the edge of Matfield to reach our lunch stop at the Dove Cote in Capel. 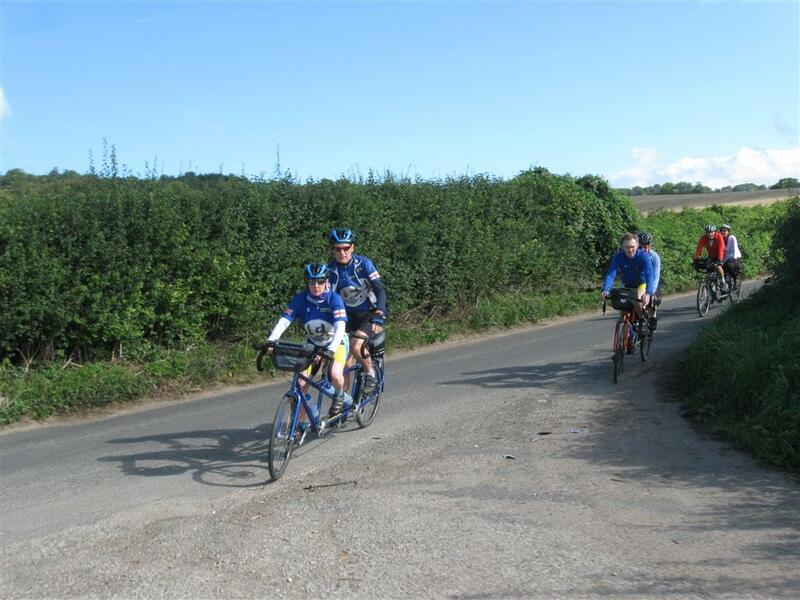 After being well refuelled we continued our circumnavigation of Tonbridge and Tunbridge Wells by riding across the flattish area to Hadlow. 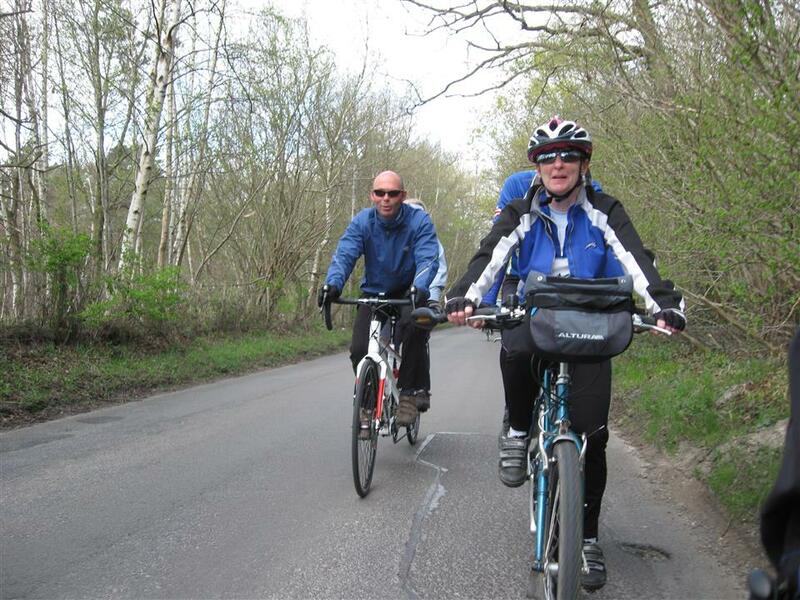 We continued through Hildenborough and Leigh. 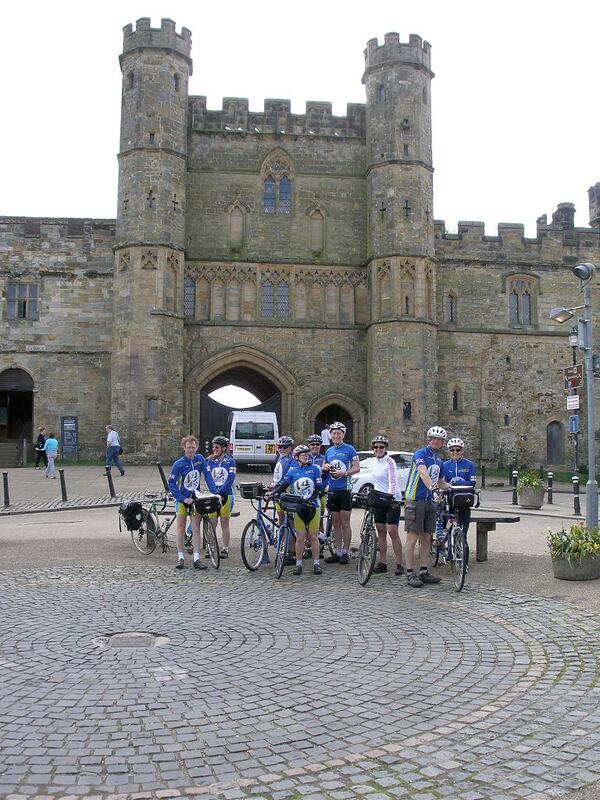 The bridleway which goes past Penshurst Place brought us back to our start point. 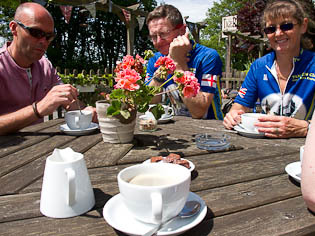 The weather was good enough to sit in the garden of the Tea Rooms, where we tucked into well-earned tea and cake. Thanks to everyone who came. We had a pleasant ride in the dry, but the stiff breeze meant that it didn't feel that warm. 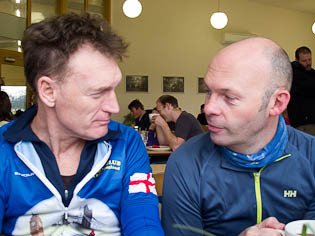 Cliff helps Mark check the new tandem yet again! I hope everyone's ready 'cos I don't want to get run over! A lovely bright sunny morning with a cool SW wind. The day started with a relaxed assembly at Northiam, Liz & Ken, Liz & Mark, Caroline and David. We had a slightly late start due to the unusually late arrival of Cliff and Pauline who had underestimated the rural nature of the A28 from Ashford. 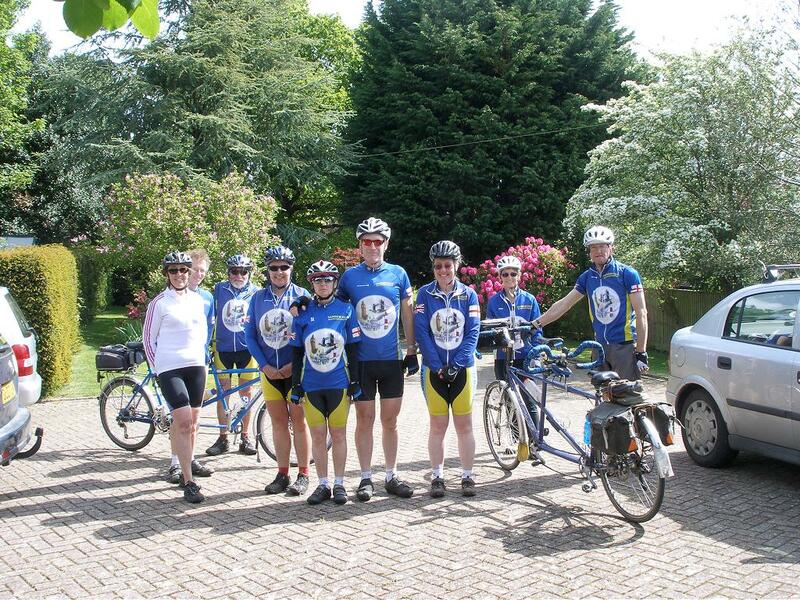 Liz & Mark’s newly blue painted Roberts with smart black mud guards was much admired. 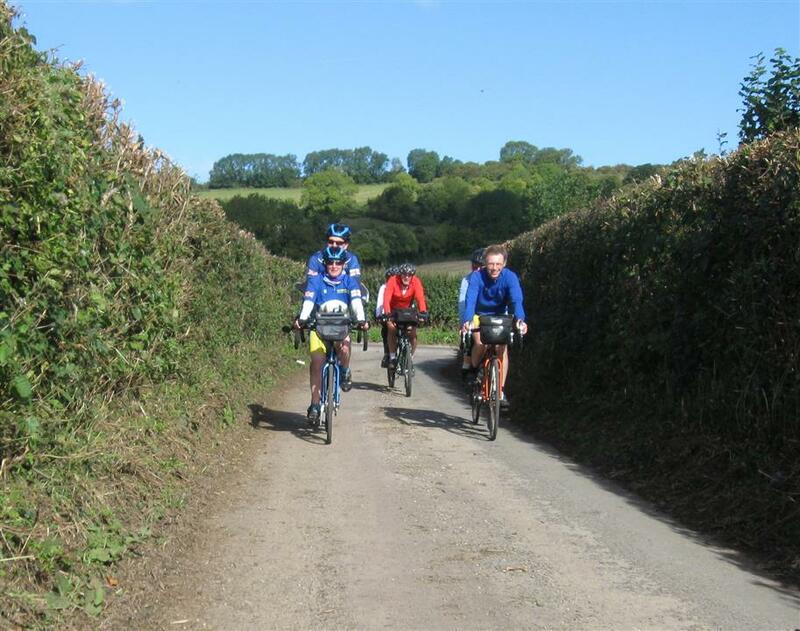 The main characteristic of this ride was the pale green luxuriant growth of the country side, the bluebells and the rhododendrons which bordered the lanes throughout the ride. The ride from Northiam to Staplecross was through the trees albeit a bit shady but the trees clear at Staplecross leading to some pleasant open riding. As we were a little late we missed out the Sedlescombe dip and its steep hill, something I was glad of much later in the day. 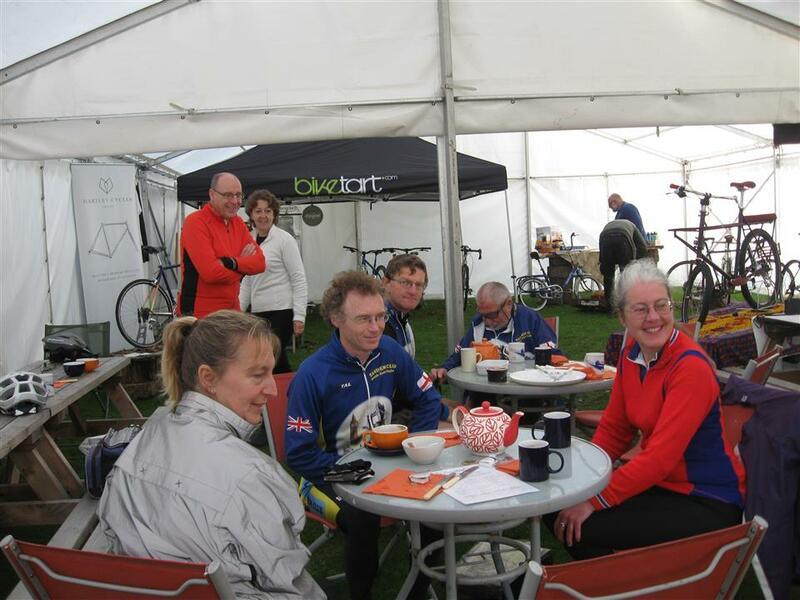 A long steady pull up to Battle was followed by tea at Mrs Burtons in the shadow of Battle Abbey. First adjustment of the smart black mud guard as Liz had been complaining of a rubbing noise. A fast section down Marley Lane took us back down to the busy A21 and then along the country lanes through Westfield towards the hill in Rock Lane. A stiff climb took us up to Ore where we had a break for some much needed water. 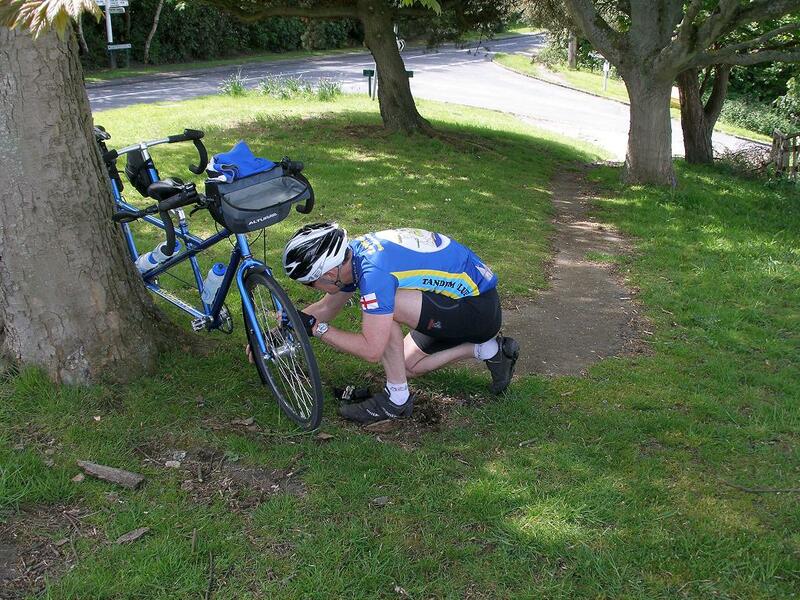 Slight delay as David investigated a suspected puncture. The climb up to the top of Battery Hill was fairly steep but steady; I don’t think the bus that we held up was very pleased. We had a fast ride along the top followed by a stop at view point. Good views, although not crystal clear, with Dungeness Power Station sitting like a castle at the end of the spit. Further adjustments were carried out to the smart black mudguard. A steep drop down Peter James Lane was followed by a short very steep climb up to Pett. Pleasant ride slightly downhill through Pett led to the leader getting carried away and missing the turn along Pannel Lane. A long climb back up the ‘two Chevron’ Chick Hill was only avoided by lots of shouting from behind. At least Liz keeps her eye on the map. The undulating lanes towards Winchelsea and lunch at the New Inn were very pleasant. A bit of a wait for lunch which provided the opportunity for further adjustment to the smart new mud guards. Lunch was very good. 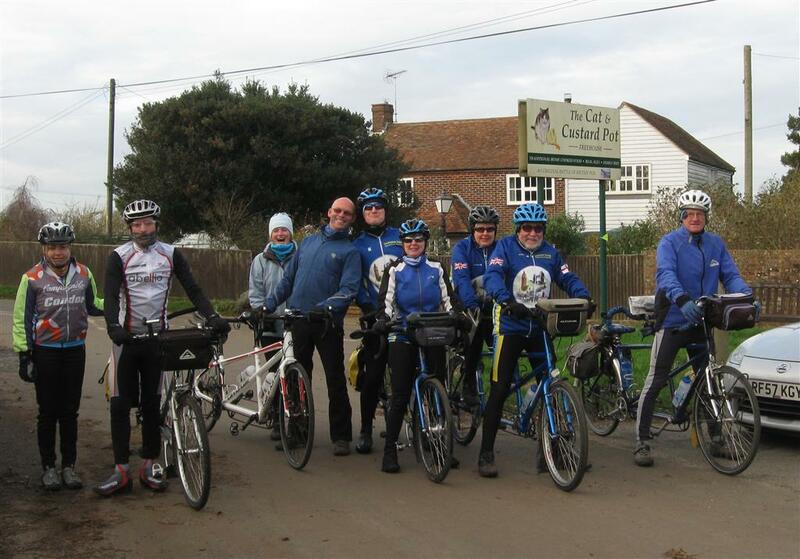 The wind had increased through lunch which made the ride to Winchelsea beach quite hard. However the downwind ride along the sea front through the nature reserve was exhilarating and we broke the 20 mph speed limit. 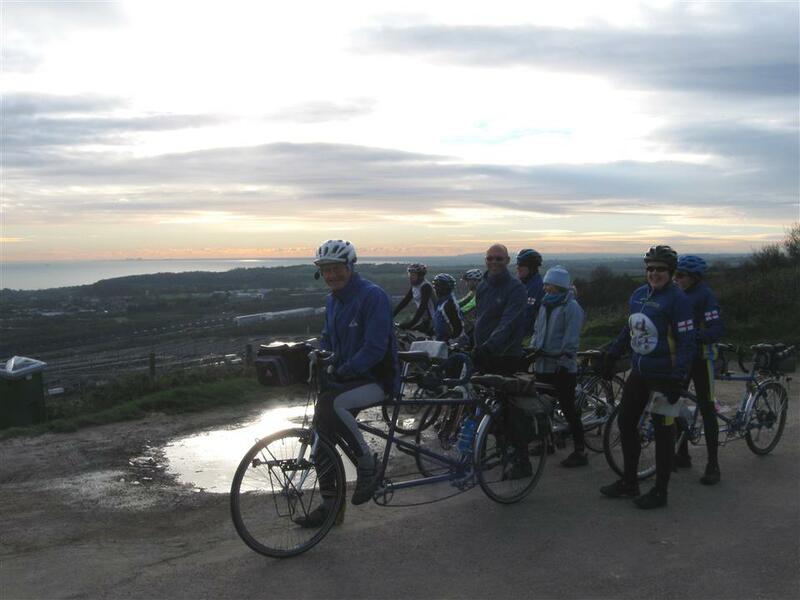 We took a short stop over looking Camber Sands for a photograph which was taken by another cyclist who was very interested in our Tandems. 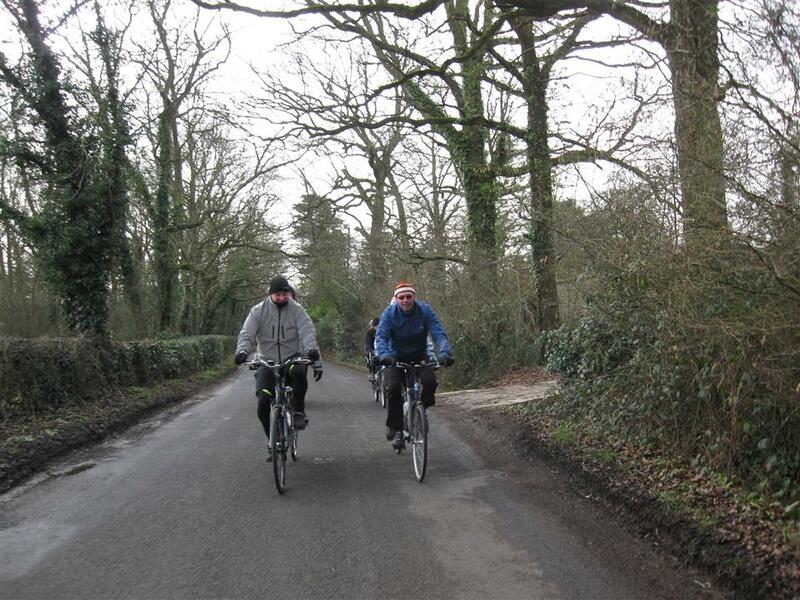 Rye Harbour road is a bit industrialised and the slight head wind made this the least pleasant part of the ride. Quite busy through Rye with a lot of motorbikes assembled at the ‘docks’. After Rye we headed along the military road for about a mile before turning back to the ‘mountains’ and heading up the lane to Iden. 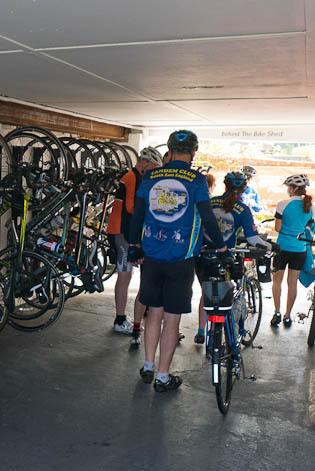 At Iden we took another much needed water stop. There was a fast drop back down the Marsh after Iden followed by the very steep hill up to the Stocks. My legs were starting to complain up here. 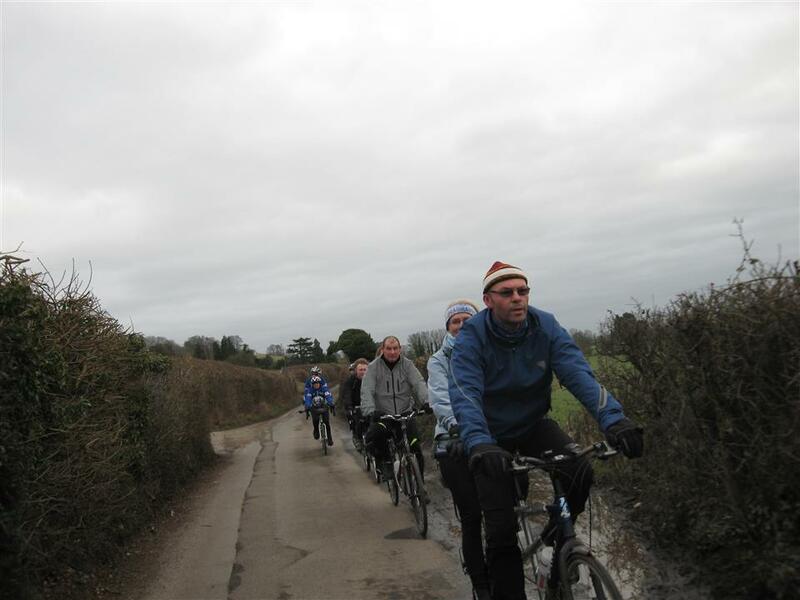 From Wittersham we dropped back down onto the Marsh and then followed the very undulating lanes to Beckley. Beckley is a very long village with a long uphill drag; the head wind and the tired legs made this quite a struggle. 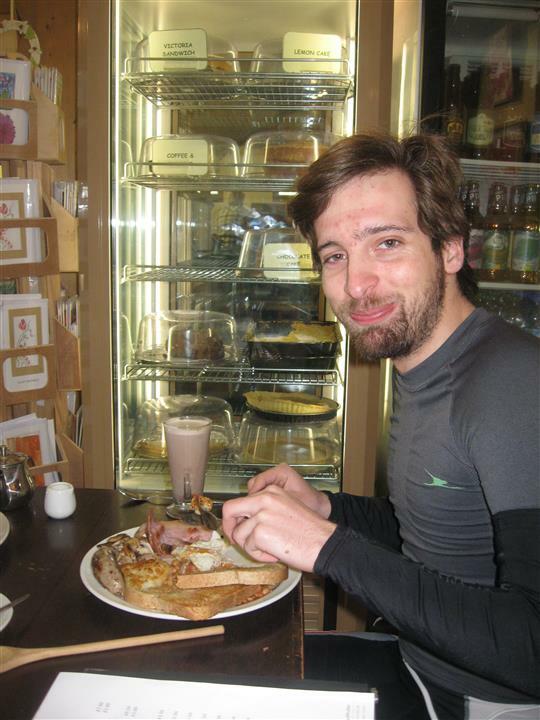 However, the lure of the cakes gave the legs a bit of impetus. It was quite a relief to get back to Northiam and the last hill of the day, our drive! We had tea and cakes on the patio and I think everyone appreciated Anne’s home baking. 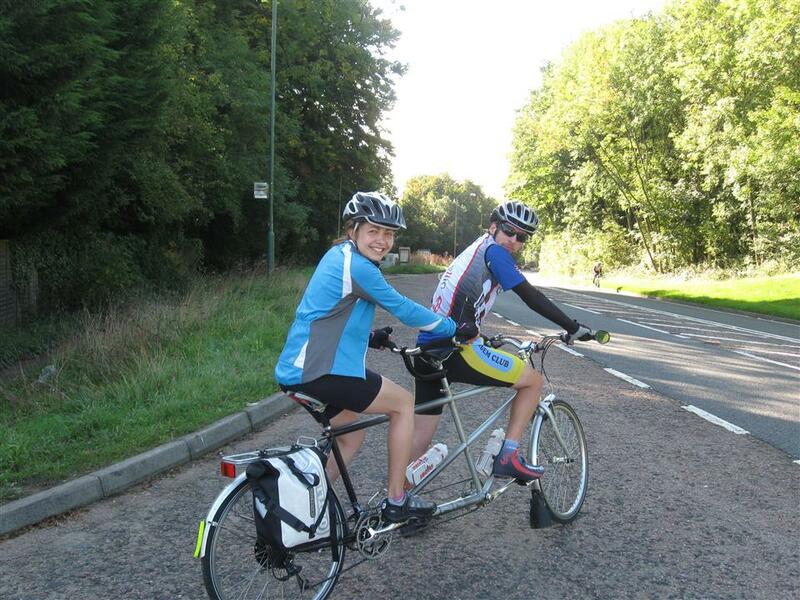 This was a long but very pleasant ride in some lovely weather with good company. 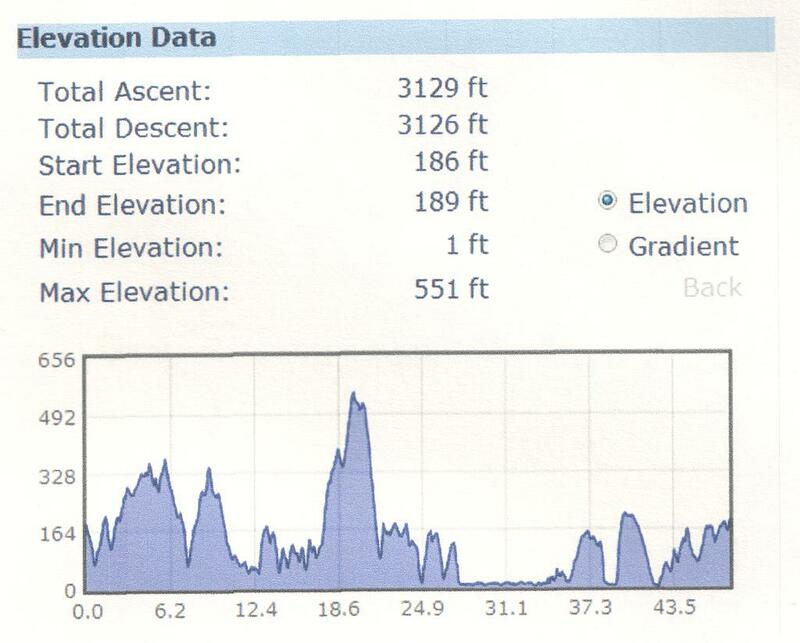 Bike and Hike calculated it at 47.72 miles and 3129 ft of ascent. Start at Pluckley, (not usual place so please ring or email) then heading out to Wye for coffee so the morning will be undulating. Lunch at Aldington. Coming back across the marshes. 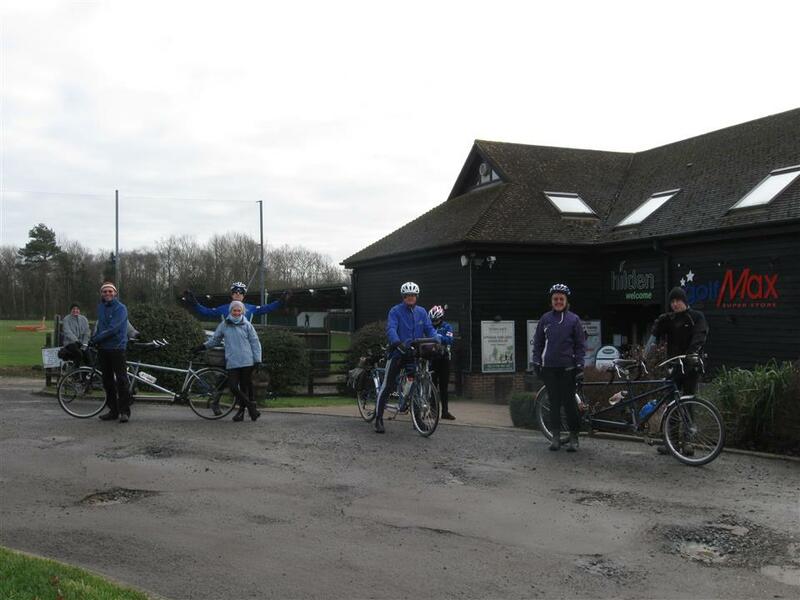 9 hardy cyclists (4 tandems, 1 solo) set off from Ditton Community Centre at 10am in the pouring rain!! Due to the persistent rain during the week we decided not to go on our planned route through Oaken Woods and took the less muddy route along North Pole Road. From here we crossed over the A26 and Barming Bridge and rode through Waterbury, Yalding and then onto Hormonden where we stopped for a well deserved warm drink at Pittlands Lakes Fisheries, who welcomed us even though we were all dripping wet. The rain had eased off as we set off again. We cycled through Paddock Wood, East Peckham, Hadlow and ended up at ‘The Kentish Rifleman’ in Dunks Green relatively dry. Again we were glad to be out of the weather and in the warm. 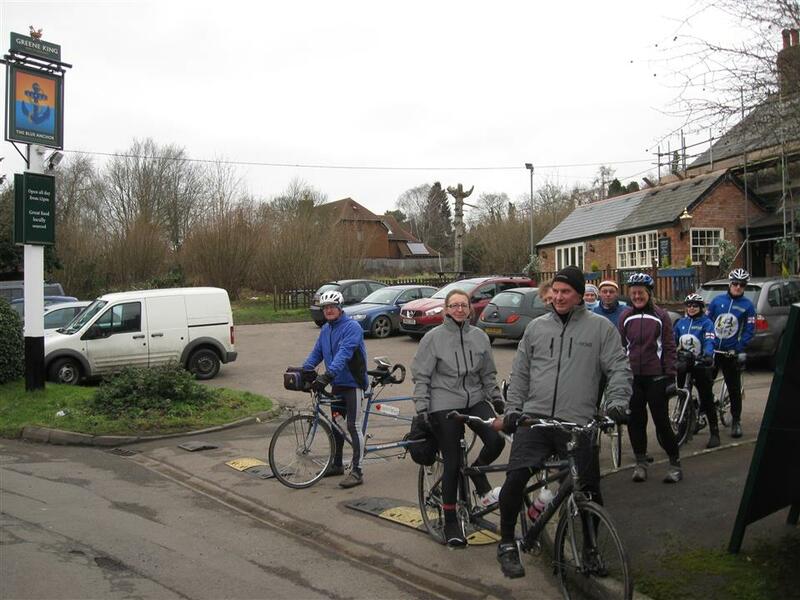 After lunch, we cycled through Plaxtol, St Mary’s Platt and West Malling. 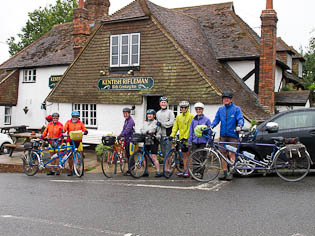 We were on our last leg home, cycling through East Malling when the heavens opened and we all arrived back in Ditton soaking wet to enjoy tea and cakes in the dry. 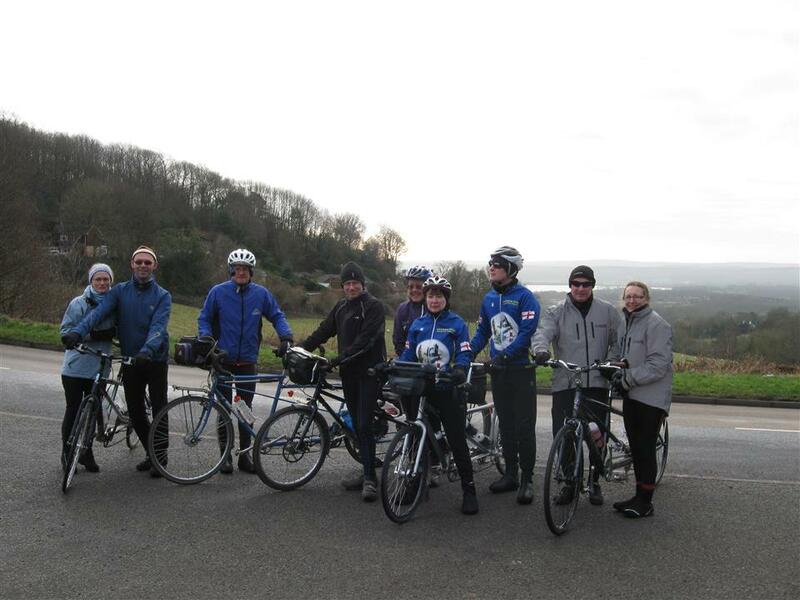 Despite the weather we all had a great day and cycled 38.9 miles. 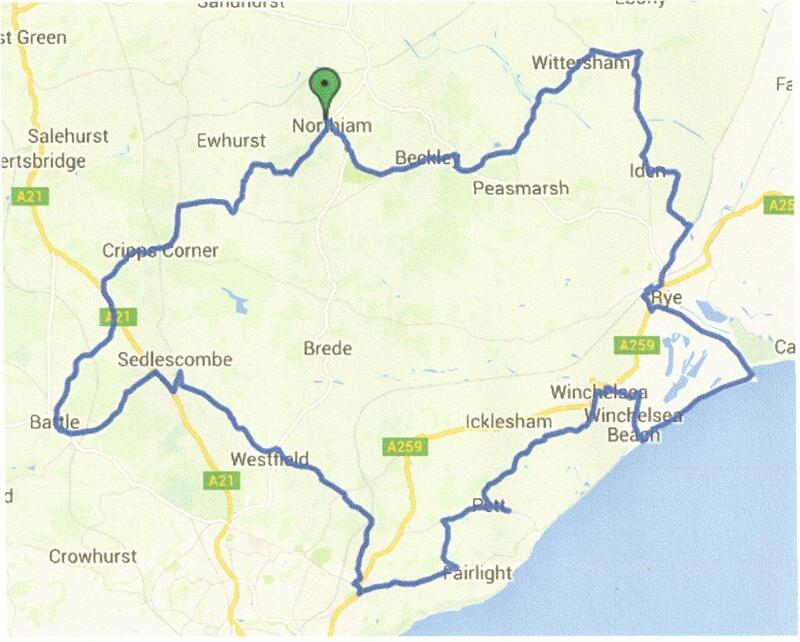 We will have stops at Westerham for coffee, Warlingham for lunch, tea at High Elms. Please let us know if you wish to join us, so we can let the pub know numbers. 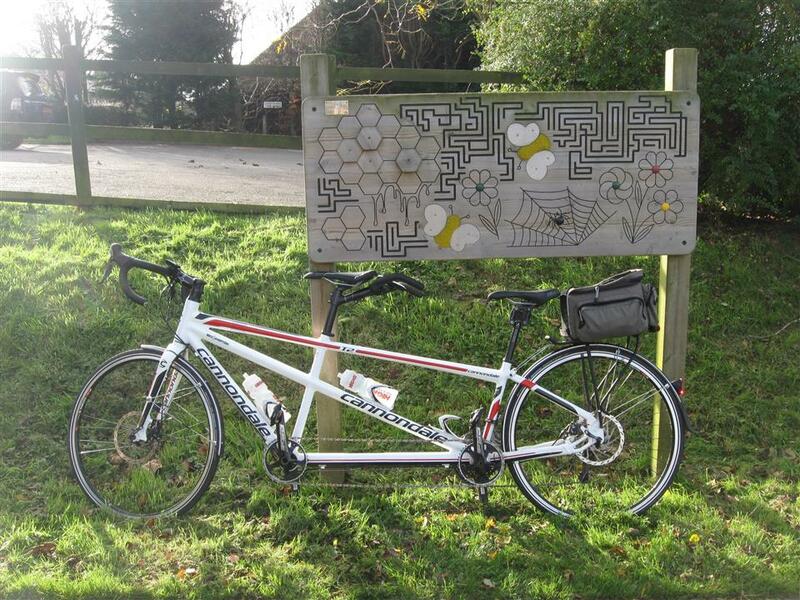 Cycle racks for (almost) all - not tall enough for tandems though! Starting from Hampton Pier Rd, the post code of the pub next door is CT6 8DL. This ride will be approx. 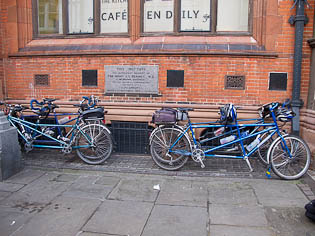 40 miles heading out to Graveney for coffee then inland towards Canterbury for lunch. Glad you paicked a sunny spot! It’s Wednesday morning and I wake up to rain on my bedroom window. It’s Thursday night I’m driving home from work and my wipers are working hard. It’s Friday and rain is running down my office window. Hmm not looking good for the Sunday ride I think to myself. I open my email and my trustee tandem riding friends have not let me down, 7 bikes confirming they will be there rain or shine; I email back promising the shine. No pressure! Its Sunday morning, I wake to hear rain on my window. Oh well, another broken promise. We ride down to the car park with a huge black cloud behind us and lighter skies in front. 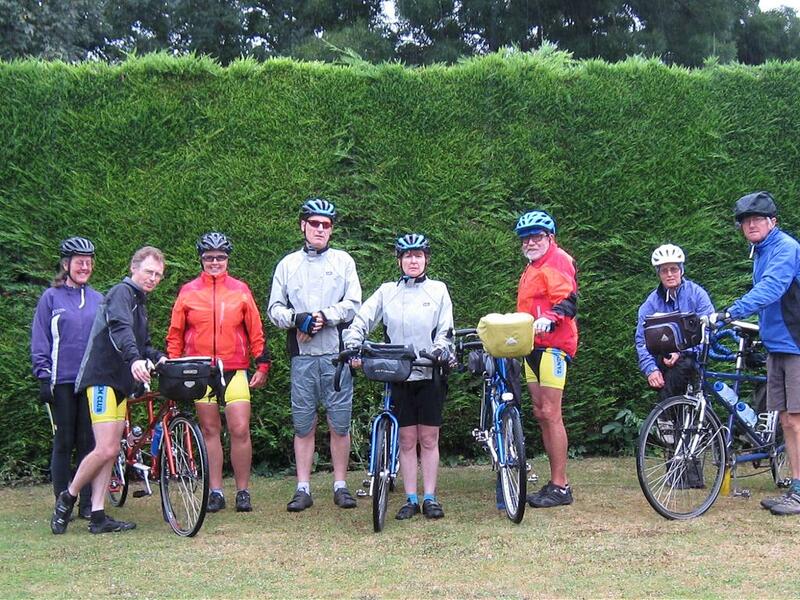 We meet our faithful tandem friends in their best wet gear. The catch up chatter soon starts and people looking happy just from getting latest news on trips and rides over the summer. The weather Gods must have heard all of the positive vibes because as we set off the blue sky started to grow and the wind was just a whisper. Our only hazards now were dog walkers and some may say their loveable K9 friends. 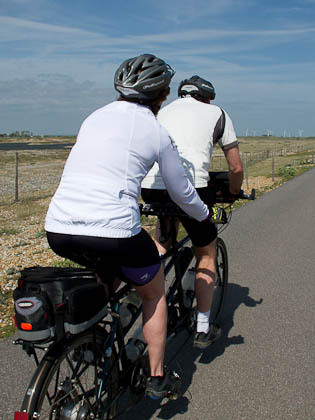 We are soon off the sea wall and into Whitstable, with fellow riders already asking about breakfast as they had travelled or had a hard night. As we pass café after café in Whitstable, I promise them not to worry the café we are going to will be great. The sun is now shining and I’m feeling confident as I make another promise, of course there will be bacon rolls! 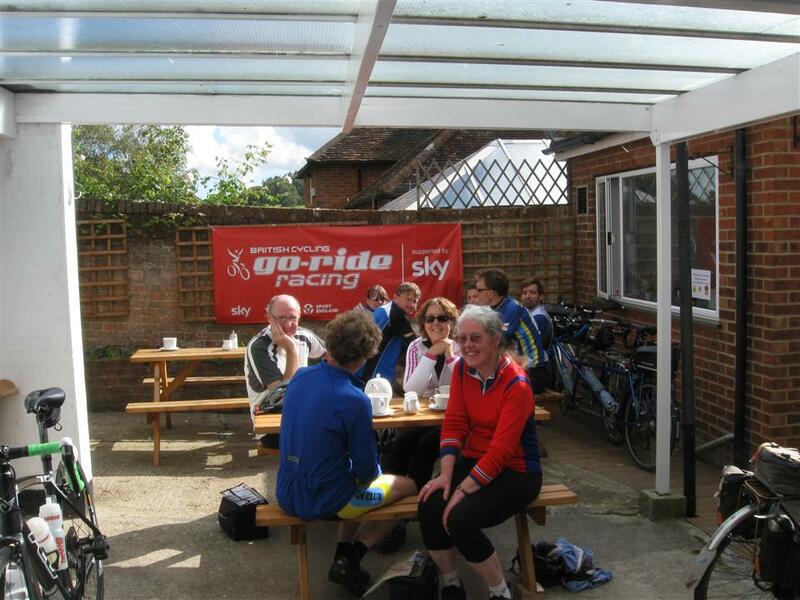 Once out of Whitstable and onto drying country lanes, we head to Graveney, with the promise of a café stop. 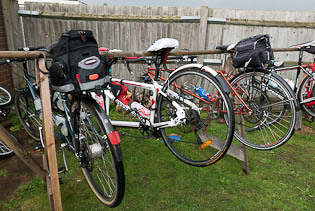 As we pull up to the new cycle pub we are surrounded by other cyclists as the café/pub are holding a cycle festival, we walk around the back and there is a marquee and music, bikes all around. Inside is packed but unfortunately packed with cyclist not savvy staff. After 20 minutes of waiting, we finally have a waitress (waitress in a loose sense of the word). The drinks order was just about manageable, but the food became a bit more of a challenge. We ended up with some scones and 1 hot chocolate short and the tale of how they had staff on Saturday cooking bacon rolls etc. but due to it being so quiet they told them not come in on Sunday morning -hello know your market! The sun is still shining so one promise is going well, bacon rolls not so good. 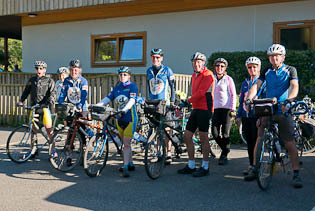 We set off, some with rumbling stomachs and no food stop until lunch 25 miles later. We head out of Faversham and around Boughton Hill on country lanes with everybody enjoying the fresh air and beautiful autumn smell. 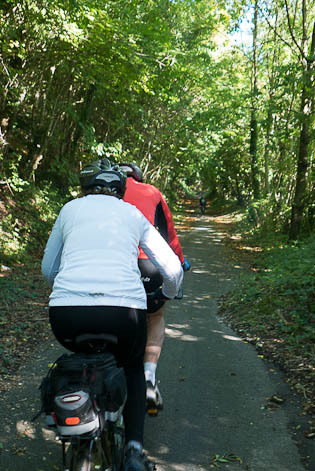 We make the most of the rolling route through apple orchards and head out towards Chartham. All going well until I hear a loud blow out behind me on a fast downhill. 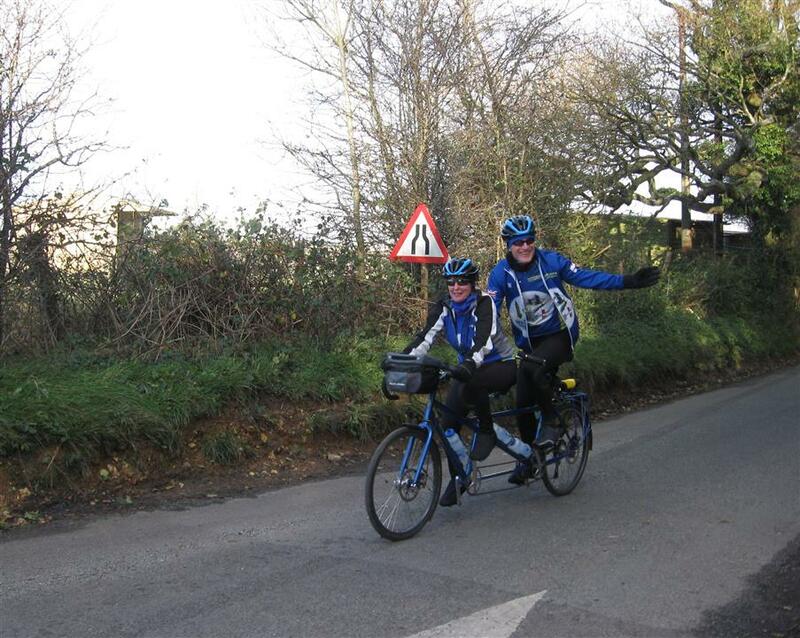 I stop to see Ken and Liz coming to a rapid wobbly stop as their front tyre had blown. Well controlled Ken! 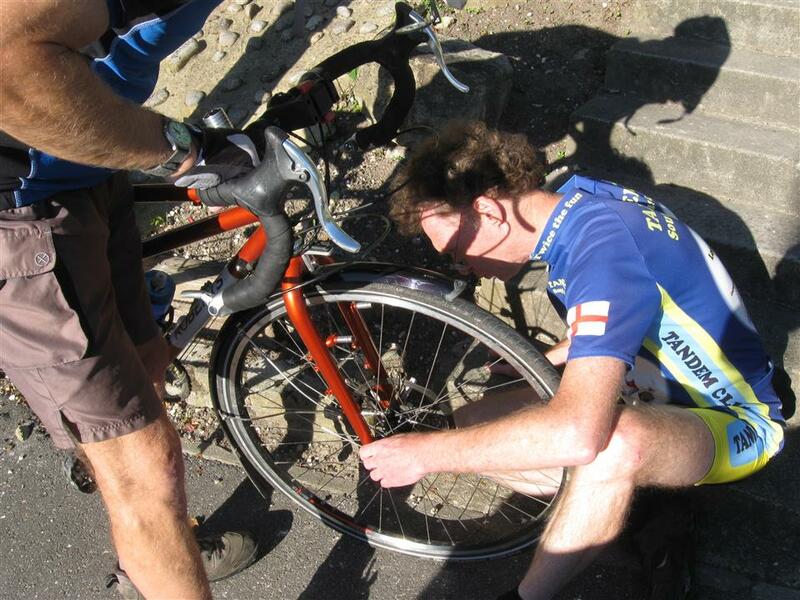 Once their hearts had slowed down they got on with fixing the puncture with the usual advice from 7 bystanders, some of the riders took advantage of the stop and just rode ahead leaving a few to help and then sprint to catch up. 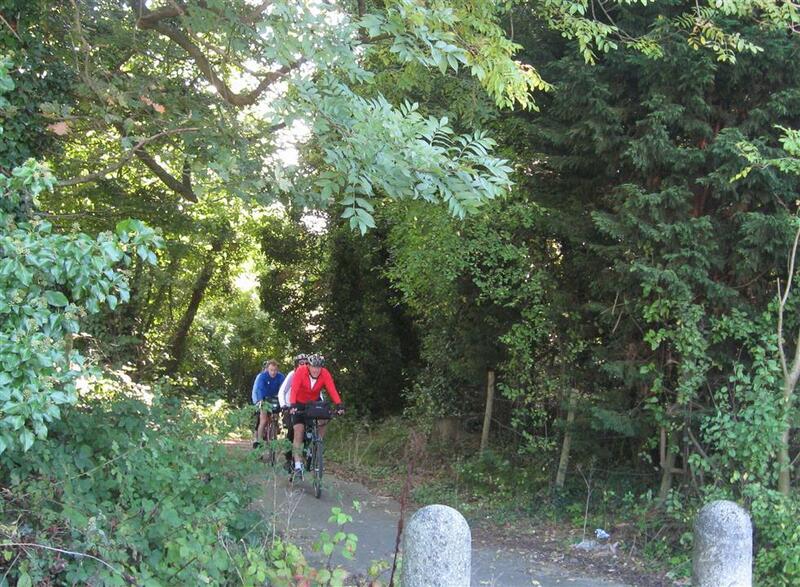 Once through Chartham, we are onto the lovely flat cycle route along the River Stour into Canterbury. With this route being quite wet I decided to take the road route through Canterbury towards Fordwich. Not the most scenic part of the route but safer than the probably now muddy cycle route after a week of rain. Once in Fordwich, we come to what some may call the first hill of the day. 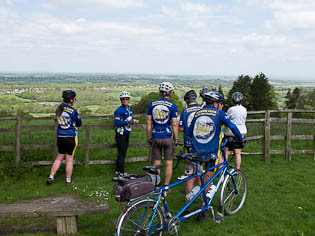 Apart from upsetting some impatient car drivers we all regrouped at the top and set off on more country lanes to the lunch stop. The sun is still shining and the promise of lunch is getting closer, I think some are forgiving me about the bacon sandwiches. 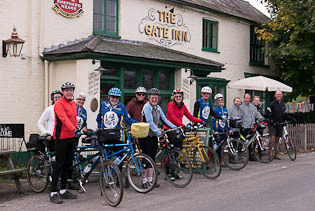 We finally arrive at Marshside and the well-earned stop in the Gate Inn Pub. What a difference, lunch was a military operation, drinks ordered in pairs and added to the food list and served with the name being called out so no confusion and served all together. 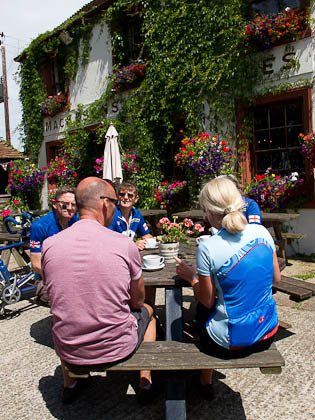 Our corner of the pub went quiet as 14 hungry cyclists tucked into what can only be described as a perfect lunch. As the plates emptied the conversation increased and everybody relaxed into their seats with a glass of wine or beer. Some had more than one glass of wine, what I must say led to one table being louder than the other. After coffees and bill settling we are back on the road for a quick 5 miles back to Herne Bay. In true tandem club tradition, it was straight up hill from the lunch stop. 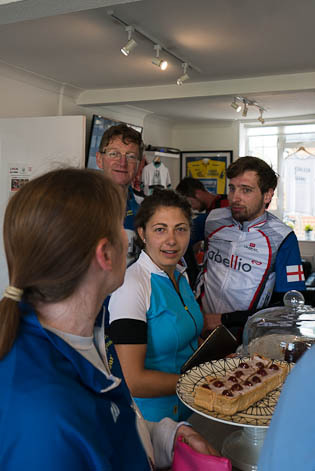 After a quick ride along the seafront with the sun still shining we got back to our house for coffee, tea and cake. With the added bottle of Prosecco and Rioja for the non-drivers. Its Monday morning, I pull back the bedroom curtains and it’s raining. 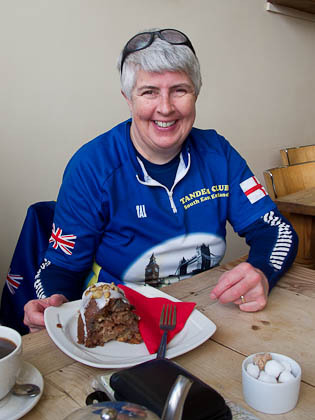 Coffee stop and lunch in pub (Pauline will send out menus for food choices nearer the time). Leaving the Cat and Custard Pot P.H. Taking in the view - can you see France? After the very high winds and rain of Saturday, it was a relief to arrive at Kearsney Abbey near Dover in sunshine and no wind. It was however freezing. With such a mild autumn we were just not used to more seasonal temperatures. 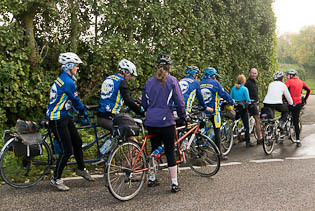 Five tandems set off along River Dour valley towards Lydden, passing the Knight’s of St John chapel at Swingfield it was too cold to stop and look around. 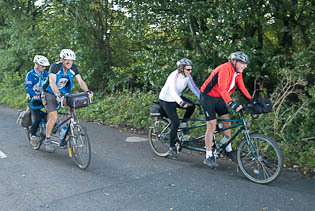 Liz and Mark's Tandem was throwing off its chain each time they tried to engage the ‘granny gear’ so after Wootton they decided to keep to the higher gears. Should at least ensure that they stay warm. 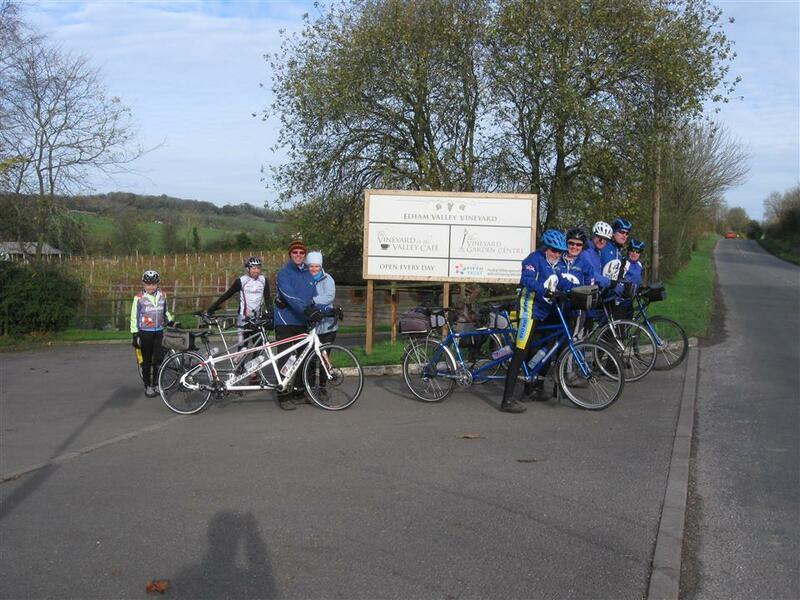 The Elham Valley Vineyard provided us with a coffee stop after 10 miles, before we embarked on the long, gradual ascent of the valley, through Elham and Lyminge to the top of the North Downs at Postling.After Etchinghill another short climb to the Cat and Custard Pot Pub at Paddlesworth. This was a lovely old pub, little changed since it was used by RAF pilots from Hawkinge aerodrome, and the walls have many pictures and newspaper articles about the pilots. The most enduring feature is however the four foot model spitfire, hurricane and tiger moth hanging from the ceiling. A mile south we stopped at the viewpoint overlooking the Eurotunnel terminus. Although cloudy, France was still clearly visible.The road follows the ridge of the North Downs and gives splendid views, although crossing the A260 it then ascends very steeply to Capel-Le-Ferne. 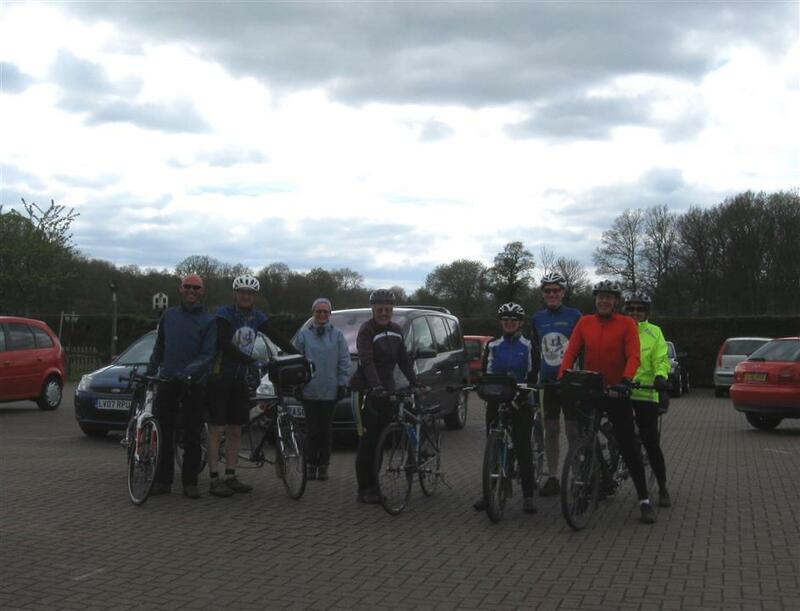 We then wound our way through Hawkinge, Ewell Minnis and Wolverton before returning to Kearsney Abbey having completed 32 miles. 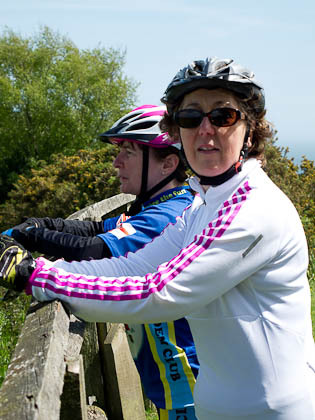 The pre-lunch ride will be led by Pauline & Cliff. Our Christmas lunch will start at 1:30pm and be a joint affair for the Kent and Surrey & Sussex Regions. It will be held at the Old Eden pub, located at the south of the town.